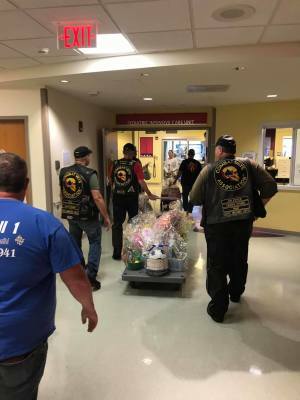 The Crazy Eights partnered with Steelhorse Law, Sixes Tavern, Drywall One, Southern Devil Harley-Davidson, Pizza Shack, Buffalo's Wild Wings, Georgia Riders, and the Ansley Foundation to deliver over 300 Easter baskets to Children's Healthcare of Atlanta (CHOA) Egleston and Scottish Rite hospitals this weekend. CHOA staff welcomed our visits and brought many smiles to the children and their parents. Our members have been actively attending local car shows. Our mission is to recruit people and vehicles to attend our June 15th event and have some fun too. This is a fantastic way to see and appreciate exquisite vehicles and meet great people at the same time. A convoy of motorcycles departed the Atlanta metro area for Columbia, SC to support a neighboring state's event. Our team spent the afternoon with SC members, officers and the State Representative before departing for home. The group had a wonderful time supporting the event, networking, riding, enjoying the beautiful weather and each others company. One of our members rode with the Nation Public Relations Officer to the North Carolina State CVMA event hosted at Emeralde Isle, NC. This annual event brings all the NC chapters together, as well as visiting chapters, to discuss CVMA business, goals and accomplishments. Another good weekend 9-10 March at the Cobb Civic center raising $ 2,461 leading from the front and standing by our Moto "Vets Helping Vets". and having the oppritunity to have dinner with members of 25-6 and 25-7. 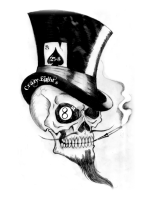 The Crazy Eights wrapped up their initial fundraising surge last week with two great events. Last Thursday, eight of our members enjoyed a fun filled bike night at Six's Tavern, and were able to share their story and advertise their Ride 4 Life event to hundreds of bikers from the local community. Riding the energy from a great bike night, six of your brothers worked the RK Gun and Knife show in Cartersville on Feb 9-10, and raised nearly $2.5K for our local military veterans and Healing 4 Heroes. 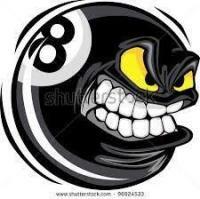 This year, Crazy Eight brothers and sisters have volunteered over 550hrs working gun shows and other venues, and have raised 50% of their goal for the year. The chapter will take a couple of weeks off before initiating its second surge of fund raising. With only have six gun shows left, it will be difficult to reach their goal of $40K. However, in addition to gun shows, the chapter will begin attending local car shows and other events to raise awareness and capital for their event. CVMA 25-8 set up shop for the second time in Marietta GA to raise money for our local veterans and Healing4Heroes. 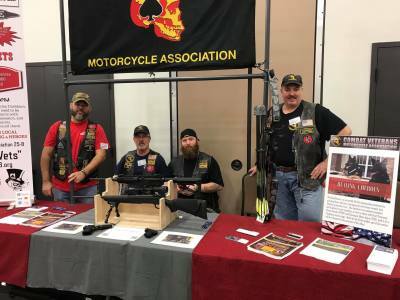 On February 2-3, six-chapter members and a H4H service dog manned a vendor table at the RK Gun and Knife Show at the Marietta Civic Center, and engaged over 2,000 spectators to raise funds for our veterans and Healing4Heroes. 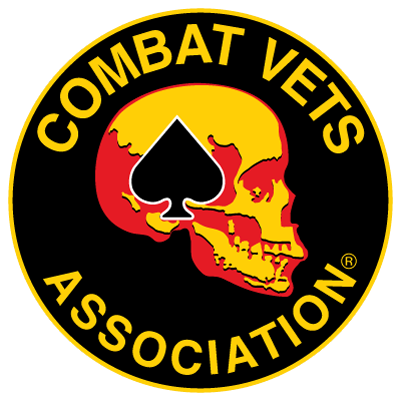 While raising over $1,700.00 to support veterans, they also acted as CMVA ambassadors promoting the mission of the Combat Veterans Motorcycle Association. North GA chapter 25-8 sets up shop at the RK Gun and Knife show in Lawrenceville, GA on Jan 26-27. While promoting the aims and ideals of the CVMA, the team engaged over 600 spectators and raised $931.67 for our veterans and Healing4Heroes. Saving a veteran… One ticket at a time! On January 12-13, GA-25-8 members were out in force at the Eastman Gun show, at the GA National Fairgrounds in Perry, GA. Working hard to promote the mission of the Combat Veterans Motorcycle Association and to raise funds for our veterans and Healing4Heroes, the 4-person team engaged over 3,000 spectators and raised $3511.41 The chapter is motivated and well on its way to reaching its $40K goal. On January 5, CVMA 25-8 officially kicked off its annual charity fundraising campaign. The chapters planning committee met in Cartersville, GA., to developed its mission statement and goals for the 3rdannual Ride 4 Life charity fundraising event. To reach its goal of raising more than $40K and 2000 event attendees, the chapter will be selling super raffle tickets for a chance to win five weapons and a Harley Davidson Motorcycle. Members will be selling tickets and handing out Ride 4 Life flyers at 16 gun and knife shows, local car shows, motorcycle events and local bike nights. Dec 15: A few chapter members joined the local community to place wreaths at the Canton Georgia National Cemetery. This was this an honorable event as well as a great opportunity to reflect on the veteran’s contribution to this nation. Dec 8: The chapter officers unofficially kicked off this season’s sanctioned event fundraising season by initiating a pre-planning event and future event registrations/opportunities. The officers plan on providing its members “the plan” at the upcoming event committee meeting in January. Dec 2: A chapter member was a guest at the Northwest Christian Church to speak with the American Heritage Girls about veterans and understand patriotism. The evening commenced with an opening prayer followed by military style basic training physical conditioning and concluded with question and answer session. Dec 2: The chapter hosted a chapter Christmas dinner and member meeting at the American Legion Post 305 Fairmount, GA. Special guests included our newly elected Georgia State Representative, Commanders from GA 25-3 and GA 25-5. Everyone brought delicious food dishes, turkey and ham, baked dishes, deserts and beverages. This was a very nice get together and feast everyone enjoyed. The chapter reflected back on 2018 through a slide show and a video of our Ride 4 Life event. Nov 24: The chapter participated in the U.S. Military Vets MC (USMVMC ) GA5’s 13thAnnual Frosty Bells Toy Run. Our members collected toys from the local community and rode with USMVMC to drop the toys off at the charity event. It was a great success and the charity spokesperson expressed her deepest and sincere thanks to everyone who participated. The event wrapped up with a chili cook off. Nov 18: The chapter partnered with the Blue Ridge VFW to help a Korean War veteran in Tunnel Hill, GA. The American Legion 112, Dalton, GA provided the roofing materials and the chapter provided the labor and time to do the installation and cleanup. The new roof allowed the homeowner to have a peace of mind that their home was water tight and they no longer needed multiple buckets to catch leaking water. Nov 10: The chapter participated in a brisk cold morning ride in the annual Marietta Veterans Day Parade. This opportunity allowed our members to gain public exposure, celebrate the holiday and recognize veterans in attendance. Nov 4: The chapter partnered with the Warrior Division, U.S. Naval Sea Cadets to help two veteran families in Powder Springs GA. The first home was that of a Korean and Vietnam War veteran (Robert Hoilman) who needed some landscaping work done around the exterior of his home. 10 tons of decorative gravel was moved to the adjacent flower beds to spruce up the home. The second home was that of a World War II Purple Heart veteran (Roy Keys) who had an issue with trees and brush encroaching her wooden fence. The overgrowth was pushing the fence apart. The team removed the overgrowth and reinstalled/repaired the fence panels. An autographed picture of President Trump was provided to Mrs. Keys by the CVMA. Nov 3: The chapter participated in the U.S. Military Vets MC (USMVMC ) GA5’s Veterans United Rally. This event recognized veterans and helped build a cohesive brotherhood with the veterans and the community. Oct 20-21: The chapter hosted a relaxing and fun event at Two Wheels Lodge in Suches, GA. The cool mountain air and campfires helped bring together chapter members for a peaceful relaxing retreat. The campout created new bonds, rekindled the members and reinforced our need for our very existence-vets helping vets. Oct 13: The chapter joined Save the Hooters Ride to raise funds for Breast Cancer Awareness. The event was followed by a bike ride led by our chapter riders. The chapter in-turn build a new partner and relationship with this organization and they will be a part of next year’s Ride 4 Life event. Oct 5-6: The chapter came out in force and attended the Region 1 Rally in Lake Guntersville, AL. CVMA members from Florida, South Carolina, Alabama, Georgia, and Mississippi were all in plentiful attendance to discuss regional and state issues, participate in a memorial tribute ride and swear in newly elected members and officers. Sep 30: The chapter helped move a member’s contents from his home to a storage shelter in preparation for selling his home on short notice. Additionally, the chapter revisited his property to cut his lawn in preparation for final closing. Sep 9: The chapter participated with nearly 750 other motorcycle riders to participate in the Annual 9/11 Memorial Ride from Athens to Blairsville Georgia. The slow ride took nearly 5 hours complete and the riders all prominently displayed their flags and demonstrated ultimate respect for those who died. Sept 8: The chapter raised funds and donated $3,012.00 for Aydan de la Torre, a son of a veteran who was in need of medical care assistance. His family appeared at our meeting to be welcomed by the chapter as well as receive the donation in person. Love was certainly shared by everyone. Aug 29: The chapter supported and was a vendor at the second Ride for Connor fundraising event in Kennesaw, GA. 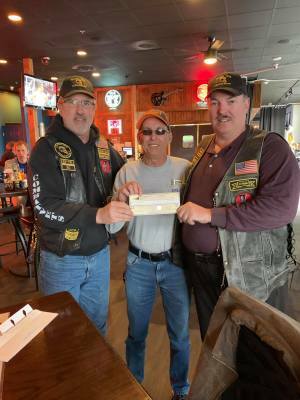 The chapter members led the poker run and participated in rallying funds for his cause. Aug 22: The chapter members rode to Tennessee to participate in the TN 18-1 Sanctioned Event. Our team members built new relationships for future support and events. Aug 17-19: The chapter attended the 2018 Grassy Pond Georgia State Meeting hosted by GA 25-5. All of the Georgia chapters were in attendance and entertainment was provided. Each chapter shared their accomplishments from the year and the outgoing State Representative said his farewell. Chapter goals and expectations were discussed with the chapter’s Top-Two. Aug 15: The chapter attended GA-25-3’s Mountain Mania sanctioned event in Blairsville GA.
July 14: The chapter supported and was a vendor at the Ride for Connor fundraising event in Kennesaw, GA. Connor Willaford, a son of a Navy mother, was seriously injured when a car driven by a distracted driver hit Connor while stationary on his motorcycle waiting to make a left turn. His injuries left him paralyzed from the waste down. The chapter members came together to help this young man and his family and led the poker run and participated in rallying funds for his cause. 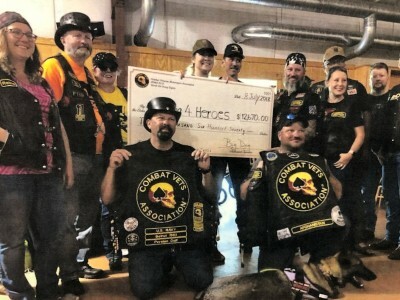 July 8: The chapter gathered to ride to Peachtree City to hand over a check in the amount of $12,670 to Healing4Heroes. The check was presented to the non-profit founder, Piper Hill in front of her students that were there for training. The students and staff were very appreciative and our chapter members were touched by the acceptance of the donation for such a worthy cause. June 18-24: The chapter had a few members ride out to El Paso Texas to attend this year’s Combat Veterans Motorcycle Association Nationals Event. Chapters from all 50 states were in attendance. June 9: The chapter hosted its annual Willie “Boats” Wallace Ride 4 Life event in Cartersville, GA. The event, partnered with Southern Devil Harley-Davidson, brought in over 600 people in attendance. The chapter hosted 32 vendors, a bikini car/bike wash, 50-50 raffle, live auction, weapons raffle, cold beverages, food trucks, service dog demonstrations and a police escorted memorial ride. Atomic Boogie band was the guest performer. Proceeds from this event will be provided to the non-profit organization Healing4 Heroes.